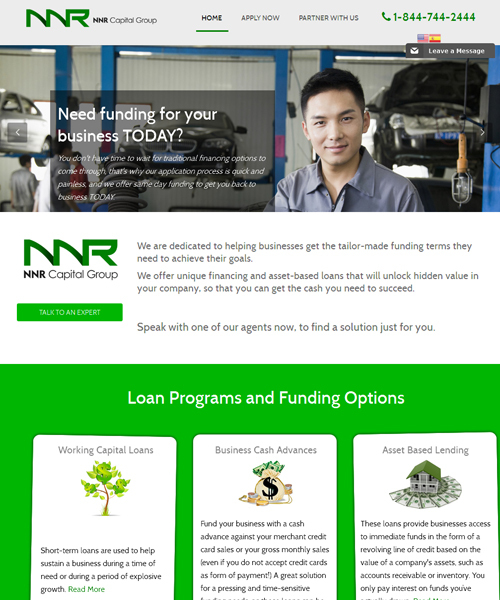 Objective: NNR Capital Group is a business funding and business financing company that needed a strong Financial web presence in the South Florida market. Our web development team incorporated a number of database generated solutions in the website such as blogs and interactive slideshows and menu systems. NNR Capital Group needed an online presence that could be easily updated and managed by the client's employees to do weekly and monthly updates and also weekly blog posts. Tatem Web Design's Team also incorporated Live Chat features and instant message modules so that users could instantly speak with the client about getting business funding. The website is fully expandable to encompass new features as the client grows their Capital Lending and Business Lending and Financing business. Tatem Web Design - We did a full CMS web site using Joomla 3.3.2 for this client's website, email , live chat, blog, interactive forms. Provided client with training, we currently provide support, we manage the web hosting, email, website stats.